Distinguishing Characteristics: White female. Blonde/Light brown curly hair; green eyes. Light complexion. Pierced ears, small mole on right side of chin, appendectomy scar. Clothing: Black pants, a cream colored blouse; a black purse containing keys with a small wooden “cross” key chain. Gold ring with a “shell” design on right hand, necklace with a diamond “heart” pendant, diamond stud earrings, and a gold watch, a wedding band, and possibly a thumb ring. 25 Dec 1996 Patty Vaughan was last seen between 18.30 – 21.00 by her estranged husband at their residence in Wilson County, Texas. 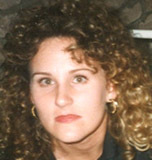 Patty and her husband began a trial separation in October 1996. He moved into an apartment in San Antonio, Texas and Patty remained at their residence on Oak Park Road in La Vernia, Texas with their three children. The couple had been married since 1985. Patty was dating a former boyfriend in December 1996 and the relationship apparently caused an argument between Patty and her estranged husband at her home on December 25, 1996. She is believed to have driven off after an argument with her husband. Her husband told authorities that Patty left the house alone on December 25 and simply vanished. He filed for divorce from his wife on December 26, one day after Patty was last seen. Other family members reported her as a missing person to authorities. On December 26th Patty’s blue Dodge Caravan was discovered abandoned with a flat tire, one day after she was last seen. The vehicle was located on Loop 1604 in South Bexar County, approximately 5 miles from Patty’s employer and 15 miles from her home. Tests revealed that the tire had been intentionally deflated. Dec 28th 1996 First search. 1)Pond at 1406 Rockport Road. 2)Near FM 1303 and Loop 1604 where San Antonio River passes. 3)Near Calaveras Bridge on Loop 1604. Dec 29th 1996: Bexar County Sheriff's Office Criminal Investigation Division and other evidence technicians investigated Patty's residence. Using the chemical substance Luminol to find reaction with items contained in blood, the officers found very strong reactions in the bath area, wall adjacent to bedroom door, and bedroom floor. When the officers turned off the light, they observed what appeared to be shoe prints on the bathroom floor, leading to the closet. There were also various streak or swab-type markings on the bedroom floor, adjacent to the bathroom floor and leading into the bath and closet area. She has never been located and no arrests have been made in connection with her case. Foul play is suspected in Patty’s disappearance due to the circumstances involved. NOTE: No pictures were taken at the home at the time of the search or subsequent luminol tests showing blood evidence in the master bedroom of the home. The home was never sealed as a crime scene even after Patty's blood was found. Her children were never questioned even though they were home at the time Patty disappeared. I don't understand why? And Patty family has not seen the children since Patty turned up missing. This reminds me of the Susan Powell case. This is outrageous! So sad that nothing was done to get justice for Patty. Wonder how many children and what ages they were?...They should be old enough now to tell if they saw or heard anything that day...IF they were old enough to remember it now. Fifteen years after Bexar County mother Patty Vaughn disappeared, investigators are releasing new information in the unsolved case. Christmas is time for joy and happiness for many people but for the family of Patty Vaughn it's a day that brings back nothing but pain and heartache. This Christmas will mark 15 years since Vaughn disappeared. The last time anyone saw Patty was on Christmas day 1996. While her body has never been found and no one's been charged, Iiams believes Patty's husband JR Vaughn killed her. Iiam's mother Patsy Wallace is also convinced she knows who killed Patty. "With all my heart and soul I know that JR Vaughn killed my daughter," Wallace said. She thinks the body is in the backyard of the home Patty shared with JR Vaughn, possibly under a wood pile. The family continues to hold out hope investigators will eventually come to the same conclusions they have. Meanwhile, they're left clinging to the hope that Vaughn might confess someday. Bexar County cold case investigators said despite their best efforts to rule Vaughn out as a suspect, the evidence keeps pointing to him. Investigators said they have a strong circumstantial case against Vaughn, but without the body it's a tough case to sell to prosecutors. New DNA findings in the 1996 Christmas Day disappearance of Patty Vaughan are being reported by the Bexar County Sheriff’s Office, pointing to an unknown female in the victim’s van. “I was very surprised, didn’t expect that at all,” said Deputy Adrian Ramirez with the BCSO cold case homicide unit. Ramirez said Vaughn’s ex-husband, J.R. Vaughn, remains a person of interest, given he was the last one to see her alive, and the estranged couple had argued that evening at their Wilson County home. Vaughn’s blue Dodge van was found two days later in south Bexar County. Ramirez said undisclosed items found in the van had been tested before, but the latest DNA science pointed to a female not related to the victim. However, Vaughn’s body has yet to be found, although at one point it was believed to have been encased in a concrete foundation. Ramirez said the latest findings bolster what was first thought. “We’ve always felt that there was somebody else involved,” Ramirez said, given the distance from her home to where her van was abandoned. Based on other information, Ramirez said he thinks he knows who that female someone is, but to obtain their DNA as further proof, he needs probable cause. Ramirez said they are urged to call him directly at 335-6041 or Louis Antu at 335-6034 in the cold case homicide unit. I wonder who these people are that live in that house now and why they will not allow LE to search that property? Relatives/friends of the husband maybe? Seems like if they don't have anything to hide they wouldn't mind the place being searched. Highly suspicious. Can't LE get a search warrant? I am positive I've seen this case featured on one of the I.D. channels quite a while back. Monday brought new activity in the ongoing search for Patty Vaughn, who was last seen in 1996. Several law enforcement agencies were back out at her former husband's property on Monday. Investigators with the Bexar County Sheriff's Office and the FBI said that they were asked to be there by Wilson County sheriff's officials and the Texas Rangers, but just as observers. Vaughn's husband, JR Vaughn, has been a person of interest in her disappearance. There have been searches on properties all over South Texas over the years and several different agencies have investigated her disappearance.